One of my biggest qualms of tracking my portfolio price movement is that, I dont have a consolidated app that can monitor all my holdings in both the Singapore market and the US market, especially for the Singapore market. What I usually do, is that I go and individually google the prices of my Singapore holdings and then update my personal excel sheet. For the Singapore stocks, I have to track this every single day. And it is a chore. Another problem I face is that, because I have 2 portfolios in different currencies – one in USD (for US stocks) and another in SGD (for SGD), I cant have a consolidated view of my total portfolio value unless I manually update them on my excel sheet. However, I have finally found an app that allows me to track all of the holdings in a consolidated view, and I cant believe it was just sitting there in front of me. 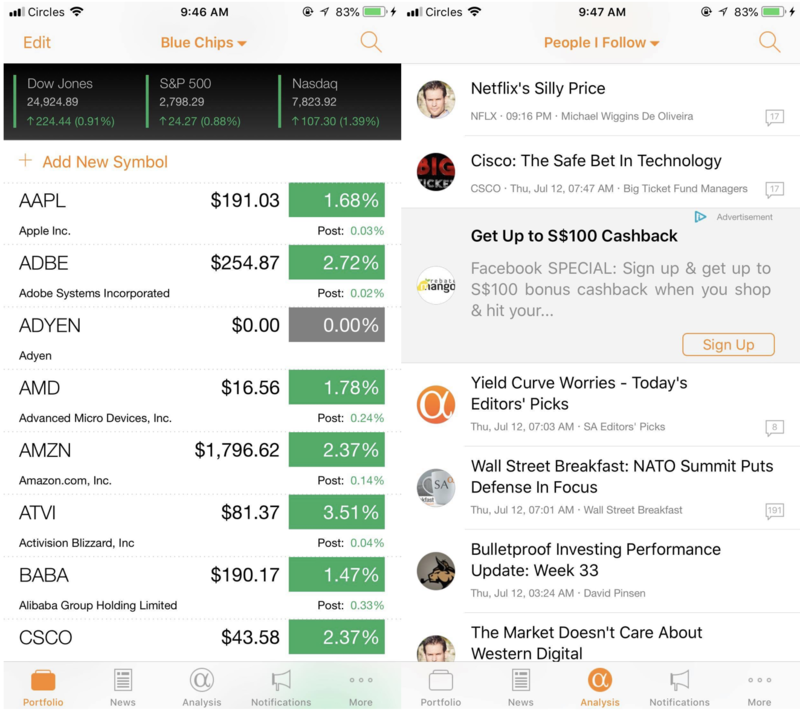 You can easily add watchlist and create your portfolio and see the price movement daily through its mobile app. There are also great articles you can read, contributed by some of the best financial analysts in the world. I use this primarily to track my US holdings and their price movement, as well as reading analysis of companies I am interested in. Lo and behold, this is the app that was obviously right in front of me – Yahoo Finance. The reason I said that it was right in front of me is because, every time when I am googling for the SG stock prices, Yahoo Finance will be the highest ranked search results, informing me on what are the prices. To track my SG portfolio, I’ve tried other apps before this – SGX Mobile, Bloomberg, and a few others, but all of them doesnt feel right. But through luck, I randomly downloaded the Yahoo Finance app while looking for portfolio apps in the app store, and fell right in love with it. 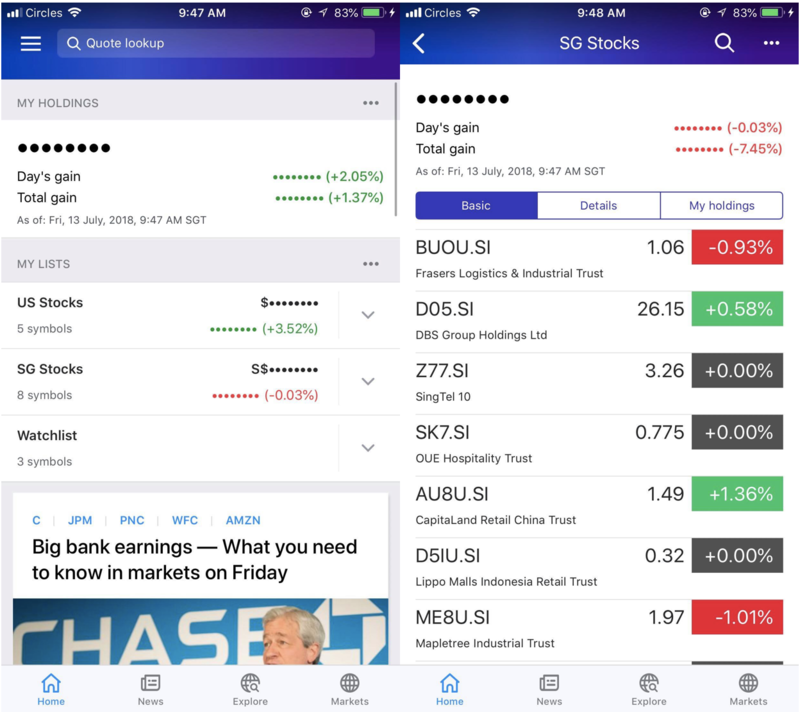 With the Yahoo Finance mobile app, you can create multiple portfolios, enter your holdings and entry date, and you can track the gains and losses of the portfolio. You can also create watchlists to track stocks that you are interested in. The best part? I can track my US holdings in USD and also SG holdings in SGD in their individual currencies, and there is a consolidated total portfolio value (of my US and SG portfolios) which the app will display! This is my primary app now to get a quick snapshot of my equities holding. Yahoo Finance also shows you the day gain of your portfolio, and you can read related articles an announcements of your individual stocks. Perfect – exactly what I was looking for. Only downside is, for your holdings, you can’t include the trading fees, so the % gain or losses reflected on Yahoo Finance is not taking into consideration of the fees (hence your gain might be slightly lower / loss are slightly higher). But that’s totally acceptable given the other benefits of the app. Highly recommended.